Rev. Gary David Knerr (Elder) from Lansdale: Christ UMC to Senior Pastor, Grove UMC. Rev. Kevin M. Rutledge (Elder) from St. Georges UMC in Peninsula Delaware Conference to Associate Pastor, Springfield: Covenant UMC. The Rev. Dr. Sharon Barley (Full-time Local Pastor) to Half-Time Extension Ministry at Samaritan Counseling Center as Director of Clergy & Congregational Care, effective Feb. 1. Also continuing in her current half-time appointment as Senior Pastor at Neffsville: Long Memorial UMC. Glenn Colliver, 88, longtime Lay Member to Annual Conference, died Feb. 9, 2016. A member of Lansdale UMC, he served on conference and district committees and was Conference Historian and Archivist. His Celebration of Life service will be Feb. 13, at 2:30 PM, at Dock Woods Community Chapel, 275 Dock Drive, Lansdale. Visitation starts at 1 PM. Memorial contributions may be made to Lansdale UMC, 300 N. Broad St., Lansdale PA 19446. He is survived by his wife, Verna Colliver, and other family. Grace Southwell McIntire (nee Hallman), 91, died Feb. 10, 2016. She served 32 years as a member to Annual Conference from the former Tacony UMC in Philadelphia, which closed in 1999. She is survived by her 3 adult children, John McIntire, Patricia Briggs and the Rev. James McIntire, pastor of Hope UMC in Havertown, along with eight grandchildren, three step-grandchildren and 10 great-grandchildren. Grace's Service of Death and Resurrection will be held at her church, Neshamony UMC in Hulmeville, Pa., on Tuesday, Feb 16, at 11 AM, with visitation at 10 AM. In lieu of flowers, donations may be made to "Lindsay's Gift," a family fund providing accessibility grants to churches, c/o Rev. James F. McIntire, 200 Treaty Road, Drexel Hill, PA 19026, www.gofundme.com/LindsaysGift . Edward T. Fell, a Lay Member to Annual Conference since 2005, died February 4, 2016. He was a member of Calvary UMC in Philadelphia, University City. A service in his memory will be held at Calvary UMC, 801 S. 48th Street, Philadelphia, PA 19143, on Saturday, Feb. 13, at 10 AM, with a viewing at 9 AM. An academic scholarship fund has been created by Ed's family. Donations made payable to the Edward T. Fell Memorial Scholarship Fund should be sent to: PNC Bank, 6855 Frankford Avenue, Philadelphia, PA 19135, to the attention of Debra Thomas-Meredith, VP Branch Manager. Condolences may be sent to the family, in care of Ed's niece, Clarice Spann, 1748 Scattergood St. Philadelphia, PA 19124. Many Eastern PA Conference churches welcomed worshippers for Ash Wednesday service Feb. 10 to signify the beginning of Lent, a season of sacrifice and sacred commitment to follow and focus on Christ above all else. Making the sign of the cross with their thumbs, pastors adorned waiting foreheads with symbolic ashes and uttered words of remembrance, repentance and recommitment. So what is meant by this time-honored religious practice? UM News Service writer Joe Iovino interprets for us the words spoken and the important meaning of Ash Wednesday. Be sure to read Bishop Peggy Johnson's new Lenten essay, "House Cleaning, Heart Cleansing," written for NEWSpirit. Reflecting on Robert Boyd Munger's book My Heart-Christ's Home , she advises us to clear and recycle the refuse and clutter from our spiritual closets and to seek the cleanliness that is surely next to godliness. Bishop Peggy Johnson asks us to lift up the ministry of worship, in both music and message, at General Conference 2016 and to pray that it edifies the collective body and each person present. The worship director will be the Rev. Laura Jaquith Bartlett, a Deacon in the Oregon-Idaho Annual Conference. 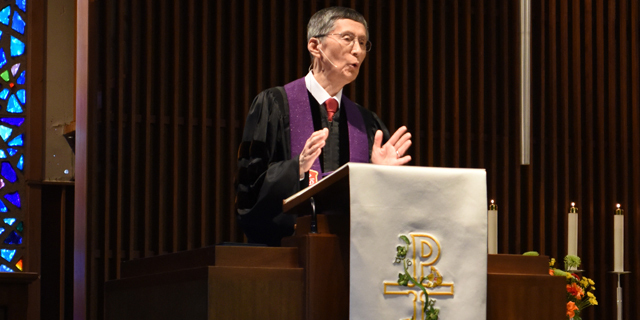 Bishop Young Jin Cho, Episcopal Leader of the UMC's Virginia Conference, delivered a deeply spiritual keynote address at the 2016 Lenten Day Apart for clergy members of the Philadelphia Episcopal Area. The Eastern PA Conference United Methodist Men will again sponsor United Methodist Night at the 76ers on Saturday, March 12 at 7:30 PM. They're urging churches to come out in force to the Wells Fargo Center to see the Sixers battle the Detroit Pistons. Order your discounted tickets online at the "Methodist" rate, or buy specially priced group tickets directly from the 76ers office. New Birth (Nuevo Nacimiento) United Methodist Church, a struggling but growing Latino church in Lebanon Pa., needs a 15-passenger van for their transportation ministry. Their old, 1984 van, which they have used for 25 years, no longer works. They are praying for a donation of either a used or new van but are willing to purchase an affordable used one. If you can help them, please contact the Rev. Elena Ortiz at (717) 644-7055 or Elenaindia@aol.com. The next Eastern PA Conference Youth Rally will happen Sunday, April 24, from 3 to about 7 PM at Hopewell UMC in Downingtown. This 2nd annual rally will feature Todd Waites, an extraordinary one-armed keyboardist for the Christian music group ApologetiX, who often shares with concert audiences his story of how Christ enabled him to overcome adversity. Also appearing will be Hopewell's own #JesusTrending Christian youth band, and presentations from several remarkable youth and young adults. More information to come from David Piltz, Conference Coordinator of Young People's Ministries. Class begins tonight Feb. 12, from 4:30 to 9 PM, for Basic Training for Worship Planters for those who feel called to create new worship services for new people and want to know how. The training at Boehm's UMC (13 W Boehm's Road, Willow Street) continues Saturday, Feb. 13, from 8:30 AM to 5 PM. Church-planting coaches Jim and Kim Griffith will teach about identifying people, gathering them together, and planning compelling worship services that move people. Costs, schedule, and registration are online at www.boehmsumc.org/Training.This event is co-sponsored by the Eastern PA Conference, the Southwest District, and Boehm's UMC. More resources are available to promote dialogue and discipleship during Lent and Eastertide. 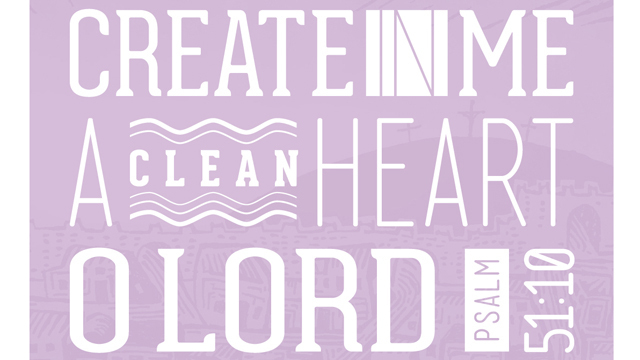 Imagine No Malaria Lenten resources feature downloadable materials , including sermon starters, videos, children's messages and a sacrificial giving calendar. Imagine No Malaria is a UMC initiative to end malaria. UM Communications' Rethink Church ministry has new Easter resources for outreach and worship that focus on the search for for meaning and new beginnings. 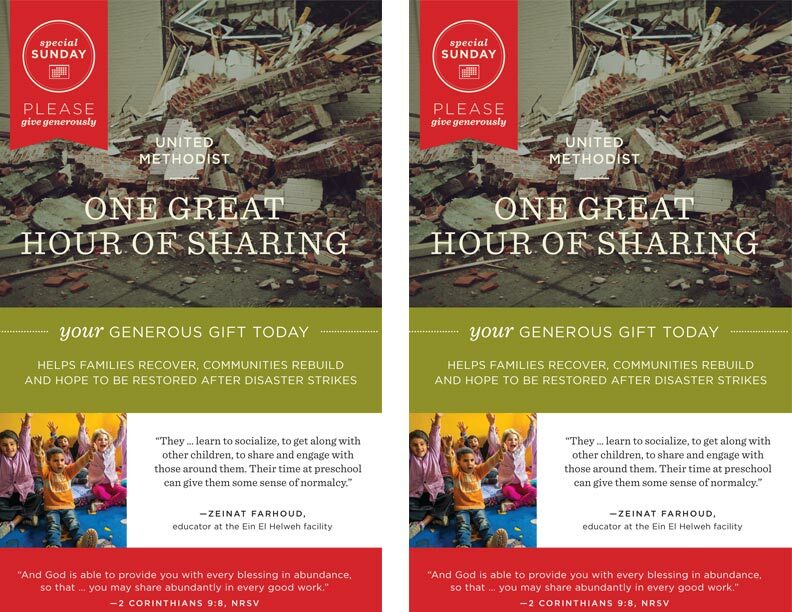 Available in different designs so churches can select messages that best connect to their communities the customizable resources include targeted postcards, door hangers and invitation cards (order by March 1). Also order free social media graphics and worship materials. Rethink Church 's national advertising effort will begin March 7 , with the message, "If changing how we think about Easter truly made it a time of new beginnings, that could change everything." 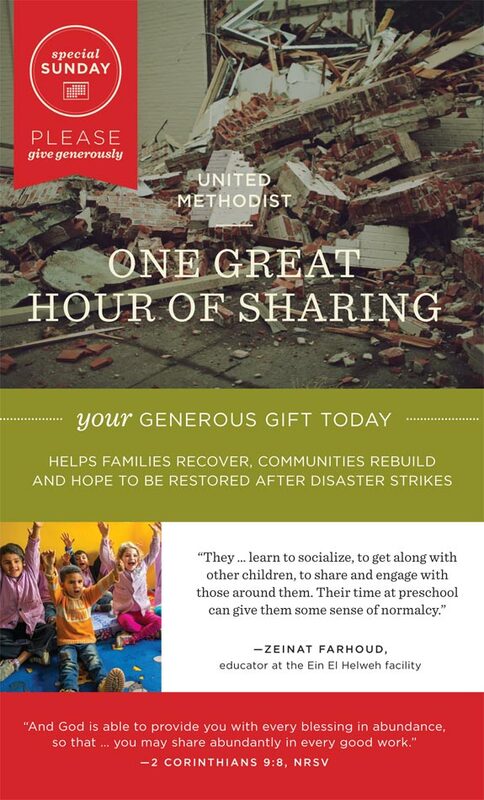 The campaign builds awareness of The United Methodist Church, but it also seeks to support local churches as they reach out with a message of faith and hope. Customized video advertisements are available through March 1. The African American Museum in Philadelphia will host a Freedmen's Bureau Project event on Thursday, Feb. 18, from 7 to 8 PM. The project is a volunteer effort to index the records of freed slaves and make them available in a free, searchable, online database. The partnership involves FamilySearch, the world's largest genealogical organization (a service of The Church of Jesus Christ of Latter-day Saints), the National Archives, the Smithsonian, and the Afro-American Historical and Genealogical Society. The community is invited to come learn about "unlocking" the histories of freed slaves and bringing stories of millions of Civil War-era African Americans to light. Download and share the flyer . Delaware Governor Jack Markell signed the state legislature's symbolic resolution Wednesday, Feb. 10, apologizing for the state's role in slavery and the wrongs of the Jim Crow era, thus atoning for nearly two centuries of systemic injustice. The state assembly approved the measure two months ago. "How will you celebrate Black History Month in February?" Denominational Website www.umc.org offers articles with ideas, stories and resources to help you prepare for the six-week season of Lent. 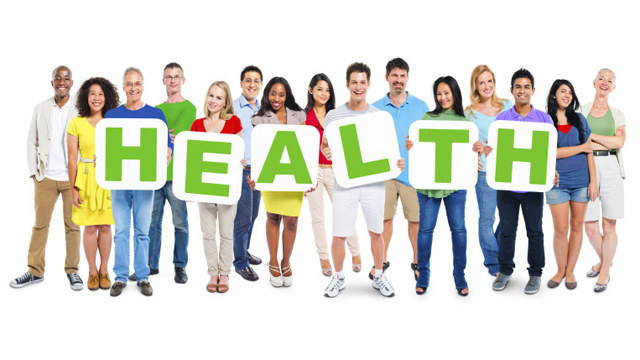 Features include: " Beyond fasting: 10 tips for a more meaningful Lent," where you can find links to other articles as well; " 40 Days of Lent: Find your own spiritual path"; " Lent: A Time to Fast and Pray"; the popular " Lent Quiz: Test your knowledge of the season" and "FAQs: Lent & Easter," which answers questions like "Why do we observe Lent before Easter?" and "Why do people give up sweets or caffeine for Lent?"